The Mixed Marvel Arts Podcast shows penance for the wrongs they have committed. In Brian’s case, it was for doubting Ghost Rider on Agents of S.H.I.E.L.D. Shaun was forced to suffer for his landslide victory in the Fantasy Comic League and over relying on Captain Marvel. 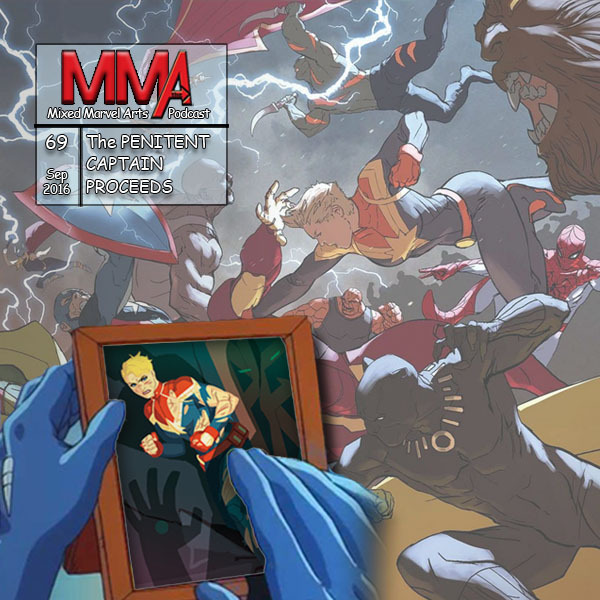 Nevertheless, Shaun stands by the beleaguered Captain and defends her role in Civil War II. Carol Danvers isn’t the only Captain being judged by her peers, however, as both of the Captain Americas fight their own personal battles. As a reward for showing great remorse, Brian reveals the news that the MMA Podcast will host their first official interview in October when they welcome two of the writers behind X-Men: The Animated Series. The hosts also announce the winner of the second Mixed Marvel Comics Giveaway, @masonrad. Episode artwork: Wolverine from X-Men: The Animated Series; Captain Marvel, vol 9 #9 by Kris Anka; Civil War II #5 by Marko Djurdjevic. ← Episode 68 – What’s Your Marvel Fantasy?